We weren’t going to blog this one but were then persuaded that we couldn’t just let it go by. Plaintiff was bitten by a sheriff’s K-9 after leading deputies on an extended car chase. He sued for negligence and won. Defendant appealed. They argued that the only proper cause of action was battery, the deputy having deliberately released the dog, and that negligence does not lie for the unlawful use of force. Instead of answering that question the court “begin[s] with the proposition that, in bringing suit, it is the plaintiff’s prerogative to identify particular harms a defendant has caused and the plaintiff is free to connect those harms to particular theories of liability as he or she sees fit.” It cites a case saying that the labels on a Complaint “have no great significance” but that “theories of liability still have substance,” from which it seems to have drawn the conclusion that labels have some significance in defining substance. 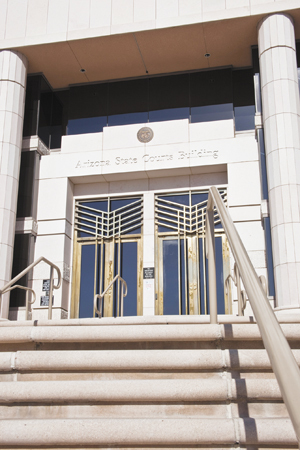 “Appellants cite no Arizona authority barring McDonald from styling this case as a negligence action rather than a battery action, and we are aware of none.” (There’s no authority against “styling” the case as a foreclosure, either; apparently this court would have let him repossess the dog.) It then cites two police-dog cases in which negligence was pleaded and not argued about on appeal. That means they are “consistent with the proposition that a plaintiff may bring an action sounding in negligence against” law enforcement. They are of course equally consistent with the proposition that the moon is made of Velveeta. Or else the wording of old Complaints that people didn’t make an issue of is now legal precedent to be cited in our courts. To give it some credit, the majority does seem to realise that there might be something just a teeny bit wrong with that analysis. So it brings in the big gun: the District Court in and for the District of Columbia. It cites a case in which that trial court allowed a person shot by the D.C. police to sue for negligence. The Restatement excludes from negligence ““conduct which creates liability because of the actor’s intention to invade a legally protected interest.” But that doesn’t apply because, it seems, Plaintiff was suing not for the intention to release the dog but for negligently forming that intention. This simplifies the law by eliminating the pesky category of intentional torts, which actually result from negligent decisions to commit them. Also at issue were the instructions. The trial court told the jury that Defendants had the burden to prove that using the dog was justified. Defendants wanted it to be Plaintiff’s burden. The statute (13-409) says that “No person in this state shall be subject to civil liability for engaging in conduct otherwise justified pursuant to the provisions of this chapter” and speaks directly to use-of-force cases. But the court decides that it needn’t decide, that justification doesn’t apply to negligence. Because it isn’t the use of force that’s at issue, you see, but instead the “negligent misperception of fact contributing to one’s decision to threaten or use force.” So much for 409. There’s more but you get the gist. Judge Espinoza, dissenting, briefly says he doesn’t agree with the negligence analysis. But mostly he criticizes the jury instructions which, from the sound of it, did get rather mixed up, perhaps in part because of the present belief that giving substantive instructions at more than one point during the trial is just a dandy idea. He also discusses why the trial court was wrong to let Plaintiff’s expert opine about the legal standard for the use of force and, specifically, about a U.S. Supreme Court case on the subject, which the majority spends several paragraphs justifying.